Welcome to the online home of Rajaram, Vidhya and Akshara!! My name is Rajaram Sethuraman and I am from India. 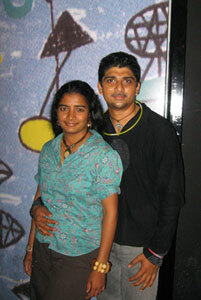 I am married and my wife’s name is Vidhya Ganesh. We have a daughter Akshara and she has a separate website at akshararajaram.com. We currently work/live in Cyprus, an island small enough to be comfortably ignored by many map makers.We currently live in Pune (My Pune Blog), a polluted city with amazingly beautiful hills all around! This site is the result of over 4 years of dabbling with various online setups like blogs, egroups, free sites and the like. But, more often than not, these ideas stop at the stage of choosing a title, as i get frustrated from the fact that all the titles i can think of would have already been taken. Even now, I can’t understand why a guy called Anil Mahajan would register rajarams.com. But, it took my brain many months to realise that i could be known as srajaram too! So, finally i went ahead and registered this domain. UPDATE (Nov 2006): rajarams.com is now available. Guess Anil Mahajan was troubled by my celebrity status and decided not to renew the domain! UPDATE (May 2007) rajarams.com is now taken by an entity called MetaPredict and converted into a made-for-ads spam site. I have not created this site with the idea that Microsoft would buy this domain from me some day for a million $$.But, if i do end up becoming famous, I hope Microsoft buys this domain and not the one from MetaPredict! Vidhya feels that i am spending too much time on my site’s activities and should move on to a new hobby very soon or i will end up becoming crazy! I m frm delhi…I dnt knw dat wht should i talk 2 u.
on the whole ur site is more informative>……. I guess this would be my 3rd or 4th time.. google brings me to ur website! Probably its because we have the same tastes / ideas / pastimes?!! What brings me back, this time? Well..there’s a party am hosting for the weekend and was planning to have “Tambola” . Great images of Cyprus, could not be better, I am staying at Larnaca 2nd till 9th Noember at friend’s rented house. If I had found this site earlier, I should made them change the location to any of the places you had taken some of those atmospheric, beautiful pictures. Really capture the magic. Next time definitely going inland…. Hello… Creative ji.. I can just say you this.. “m really impressed by your work”… oops……. no more words… go head.. first time i visited this site through google.. made me very enthu to be lik you..
it was least expected by many that a guy not originally cypriot, would actually guide us to places we never knew they existed, not even on CTO website!! I’ve been writing a ‘holiday diary’ about Cyprus for geography homework and your site has been amazing! Thanks so much! It was interesting, It happens man.. Wish you Happy Life There in a Cyprus.. I am Mahesh Jadhav working as S/W engineer. google has brought me to ur site twice. and both the times it was dumb-c which has brought me here. Great publishing and cheers so substantially for your time!! …You do have a good sense of humour!!!! Enjoyed going thru your blog. Hi Rajaram, just now came accross your Cyprus blog. Fantastic job!!! We need you, your family and people like you here, so hurry back to Limassol. Wish you the best!! anyway – your site is very informative and interesting and I will check as many places as posible and will surely update you when we are back (we are going the in the middle of October 2011). do youhave any updates, new sites or recomandation for this time of year? You are doing great Rajaram. Nice updates ! to the EC Cyprus. Better live else where I think in the future. Service is no more the norm in Cyprus. Best wishes I love India and a country and its life style . I am signing off . Best wishes. Nice family and enthralling blogs! Bravo!